I ran my 6th half marathon on Sunday (11/27). This is me near the end, alongside the Indian River lagoon. My time was pretty average for me (2:24). Plantar fasciitis was killing me later that evening, but 24 hrs after run, heel is almost back to normal. Great summary here of the recent trend of barefoot/minimalist running, and the footwear options. Huaraches, foot gloves, and vibram 5-fingers. I think I would like some merrells. That is what I was thinking as I bounced off the hood of car while crossing six-lane Semoran this morning near the start of my run. The light turned green while I was crossing in front of stopped cars, but there was one open lane and a driver came on through. I thank god that he was paying attention enough to hit the brakes so it was a slow-speed collision, but a collision nonetheless. I rolled onto the asphalt and then got to my feet. I’m just fine. I reassured the drivers and waved them on their way, and I finished my run. I’m extra thankful today. The florida racing season has come to a close. 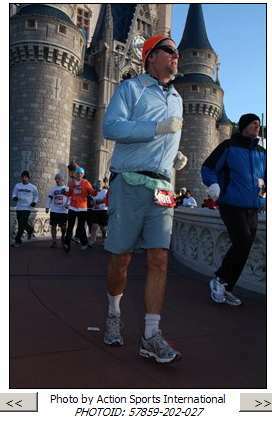 It was about this time last year that I set my sites on training for Disney. 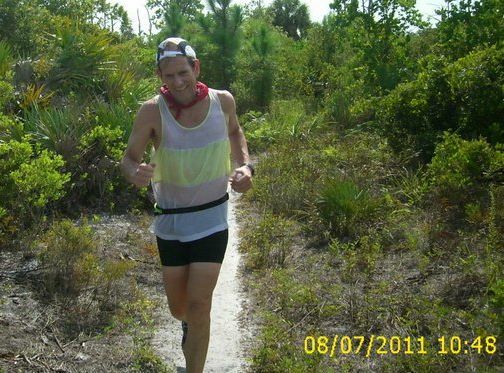 The next big race I plan on is the local OUC half marathon on 12/4/2010, so its been a little hard to keep my weekly motivation up for running. Its real easy to slip into only a couple of short runs to the Y every week I definitely want to stay in shape, keep my weight down, and be prepared for a quick ramp up to 13 mile readiness. So far so good, last week 12.3 miles, and this week I did a 6.3 and a 5.2 mile run on Monday and Wednesday respectively. Easy.